I try to run a Unity3D app (Mono) on an Android device. The Unity3D app contains ICE 3.7 (3.7.1) for .NET. I found this old forum post: https://forums.zeroc.com/discussion/5730/ice-on-mono-on-android which pointed me to build ICE with with the option MANAGED = yes. Not I try to build the latest ICE release 3.7.1 on macOS but I can't find the MANAGED option. I'm following the instructions here: https://github.com/zeroc-ice/ice/tree/3.7/csharp but can't see how to set the MANAGED option and couldn't find anything in the ICE documentation. Regarding the windows build failure seems that you have not installed the C++ SDK required to build the slice2cs Slice compiler. Try installing Windows 10 SDK (10.0.10240.0) from Visual Studio 2017 setup. Thorsten and I are working together on this project. The background to the issue is that our Ice app which works fine using Ice C++ and and Ice C# inside the Unity 3D editor fails when deployed as part of a Unity app on Android. Our Ice interface is PiTrackerServer and we are invoking method setTrackerOptionFloat(int, float) on it, but if we don't hit the exception here we hit it in some other method getting or setting float values. 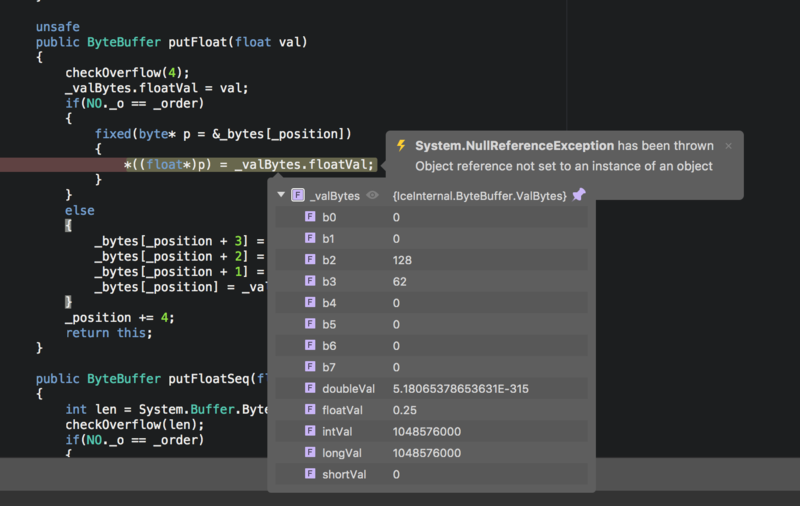 In the debugger we can see that _valBytes is correctly interpreted as floatVal 0.25, which is what we set: . Also we see that in this context _position=70 and _bytes is of size 240. At this stage, we're at a bit of a loss as to what to try next. I have try to reproduce the issue with a Xamarin project running on Android, as far as I know it uses the same mono run-time that Unity, and sending a float doesn't cause any problems would be nice if you can provide a small sample project that allow us to reproduce the issue. I'll do some more tests. Thanks for your quick reply. Sending and receiving this struct from C# code running against Ice C# inside Unity 2018.1 works fine on macOS and iOS deployments from Unity, but crashes inside some unsafe code inside Ice on Android. A C# developer has suggested that Ice might not be correctly dealing with the differences in the way that .Net and Mono pack structures. He has suggested that we need to enforce 4-byte alignment on the bool and the following fields of the structure, but since this would be in Ice-generated code, I'm unsure where exactly we'd set this. This SO answer suggests that the .Net CLR packs structs with non-trivial types differently from the way that the Mono runtime does: https://stackoverflow.com/a/24744714 .. might be relevant. 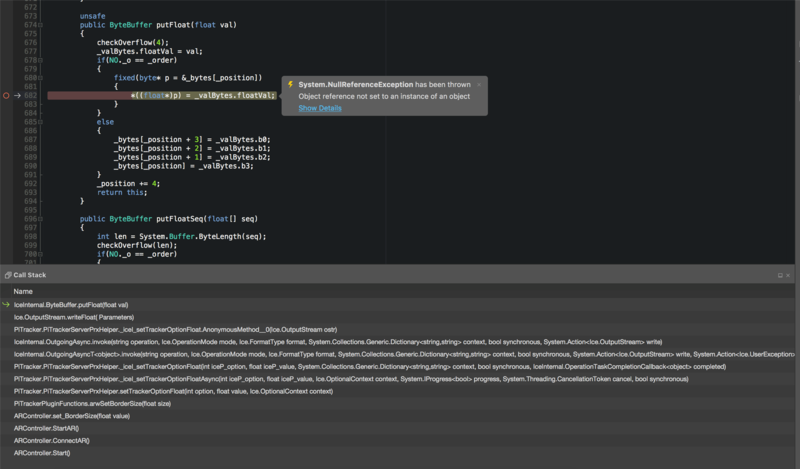 OK, we've managed to form this into a minimal test case and can reliably reproduce it from this test case. The attached archive contains a minimal project for a C++ server which implements getMyState (as above) and a Unity project which uses Ice C# to query it. 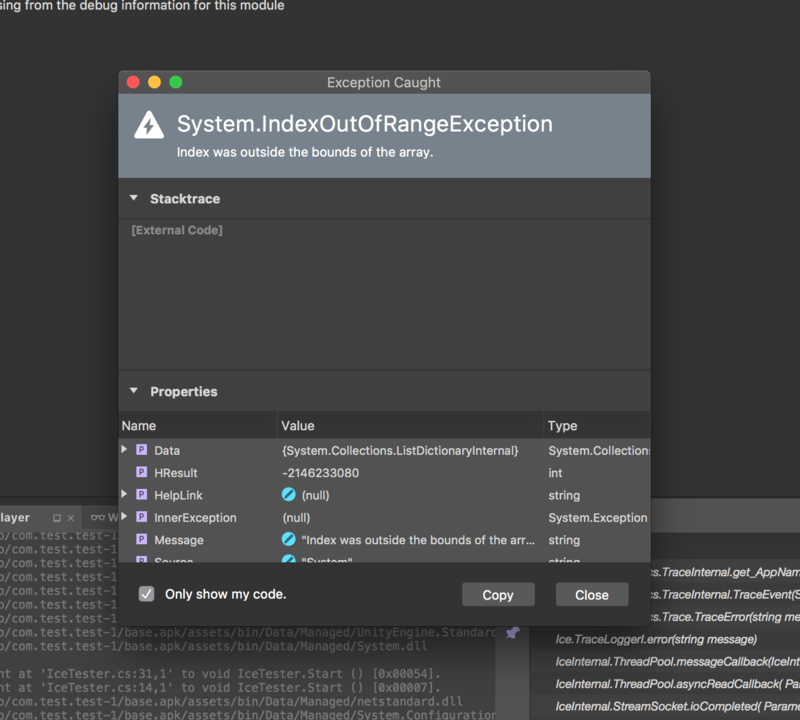 In the Unity Editor, it runs fine, but when we run it in a deployed Android app (mono runtime), we get System.IndexOutOfRangeException, as shown in the image (captured in attached Visual Studio). Many thanks Jose. We've now recompiled Ice.dll and this addresses our problem. Many thanks for your support and quick response, Jose.